How does digital delivery work? Sell Files | Shopping Cart Software..
eCommerce Shopping Cart Software Automate the process of selling downloads. Modular Merchant's digital delivery system makes it easy! You are here: Home > eCommerce Shopping Cart Software > Features > Digital Delivery > How does Digital Delivery work? Modular Merchant makes it easy to sell downloads. Any type of file can be sold as a download: videos, ebooks, music, images, information... you name it! The process of selling downloads is called Digital Delivery. First, create the product that the customer is going to buy in your store. The shopping cart software includes built-in tools for creating products easily. Give the product a name, price, images, etc. This product will appear in your online store for customers to buy. The product itself isn't a download. Instead, files will be assigned to the product in the next step. Those files will be what's downloaded by customers when they purchase product. 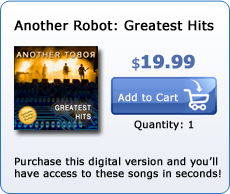 In this example, I'm creating a downloadable version of a "Greatest Hits" album for the fictitious band, Another Robot. After the product has been created, move on to the next step to assign downloads to it. This tutorial is as close as I'm going to get to being a rock star, so I'm running with it. Once the product has been created, the next step is to assign the downloads to it. Modular Merchant makes this step easy. When creating the product, you can upload the files that will become available to customers who purchase the product. Optionally, if the product's downloads have already been uploaded to another website somewhere, you can enter the URL (web address) of where each of those files is hosted. You can even mix and match uploaded files with hosted files. Either way, the customer will still be able to download those files after they purchase the product in your store. In this example, three files are being assigned to the Greatest Hits product. 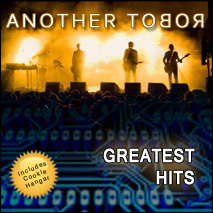 Tracks one and two are MP3s that were uploaded when I created the product. Track three is also an MP3, but it's already hosted on another website. So, instead of uploading track three again, I simply entered the URL of where it's hosted, and the store will download it from there. The customer will purchase the product in your store. The purchase of digital products is handled exactly the same as regular products. In fact, customers can even purchase digital, shipped, subscription and service-oriented products all together at the same time in your store! After the customer places their order, they will receive a password and link to your store's secure Download Area. Their access information is provided to them in both their receipt webpage and by email. After the customer logs in to your store's Download Area, they will have permission to download all of the files associated with the products they purchased. The source location of your files are never revealed, protecting them from unauthorized downloads. The entire process is verified and automated. The customer doesn't receive access to download the files until after their payment has been confirmed. And once their payment is verified, their access is granted automatically; there's no need for you to manually send them an additional email or log in to update their order. It's quick and easy for both you and the customer! Track which files are being downloaded. Resend customers their download instructions. Track the date and time of all download attempts. View the IP address of each download attempt. Edit each download's expiration date — or grant more download attempts. Manage all your downloads from a central control panel. Modular Merchant's Digital Delivery system makes it safe and simple to sell downloads. Any type of files can be assigned to products, providing the flexibility to accommodate any type of industry: music, stock photography, industry news, culinary, finance and much more. Start selling your files in your own online store today! It takes less than five minutes to create your store! Start your account today, and you can be up and running today! A fully functional, FREE thirty day trial is also available. Use it to experiment with no obligation. Everything is online, so there's nothing to install on your computer. Plus, our Support Team is available to answer questions and help you get started. You'll be up and running in no time.